Women scientists who also teach at universities play an important role in drawing more women into scientific endeavors. This oceanography professor is working aboard a research vessel during a Gulf of Mexico sampling cruise. The box-core sediment sample she is retrieving contains an intact column of seafloor sediment that will be subsampled and preserved for biogeochemical analysis. that has spread from lake to lake in the northeastern United States and Canada since its accidental introduction in the early 1980s. Thanks to Sheldon's research, a milfoil-chomping beetle, called a water weevil, is being unleashed in some New England lakes. Is this the plot for a low-budget creature feature? Not quite, according to Sheldon. The weevil dines almost exclusively on water milfoil fronds in Brownington Pond and other lakes, which is great news for native vegetation that the weed is choking out and for boaters snared by water milfoil's tangled masses. Graduate school can provide a critical bridge for women wanting to enter science specialties. Involvement in research projects, for example, gives practical experience that bolsters the student's chances for future employment. This environmental toxicology student will have the options of working in a government agency, private consulting firm, or university. in recent years, it is still somewhat rare to find women in water sciences such as oceanography and limnology. But today, there are at least a small number of women in fields from marine geology to environmental science to maritime law to ocean engineering. Shortages of women in water science careers can be traced back to female students' early childhoods, according to some sources. Studies have found that pressure to conform to traditional gender roles infiltrates the U.S. educational system and that the subconscious attitudes of society have a further effect. Although efforts are being made on many educational fronts (including how parents steer and influence their children), changing longstanding ways of thinking takes time. As long ago as 1940, oceanographer Pat Noyes remembered gazing out the window of her University of Washington chemistry class at a boat leaving a dock on Portage Bay. The boat, the Catalyst, was taking oceanography students out for their weekly cruise to study sea-water chemistry and marine creatures in Puget Sound. Noyes longed to join the scientists aboard the Catalyst, but in the early 1940s, women were not allowed on research ships because there were no facilities for them. At a time when women were actively discouraged from careers in science beyond nursing or home economics, Noyes eventually was able to achieve her dream of studying what she called "sea critters." With the help of a sympathetic chemistry professor who got her aboard the Catalyst, Noyes made her way into oceanography. She went on to earn her degree and eventually taught marine sciences at Oregon State University. Some 60 years have passed since Noyes' first venture aboard an oceanographic vessel. Today, women go to sea on research boats with equal standing to men. The future looks bright for women in water sciences. Universities, research institutions, and private companies are improving opportunities for women in these fields. But there is no doubt that women who pave the way in aquatic sciences have not always had an easy road. Although there are many points along the science path from elementary school through graduate school where girls and women fall out of the educational pipeline, graduate school may be one of the most critical times for women. An adviser willing to help a female student navigate uncharted waters is a necessity, say today's successful women aquatic scientists. 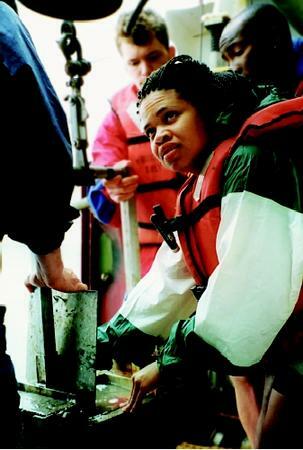 Many more women are found in the aquatic sciences than 30, 20, or even 10 years ago, say female oceanographers such as Dawn Wright, who also is an African American. As a child, Wright—whose nickname is "Deepsea Dawn" because she studies structures along mid-ocean ridges (the volcanic mountain ranges and sites of seafloor spreading that wind along the bottom of the oceans thousands of meters deep)—imagined herself as a pirate or adventurer. She knew that she wanted to be an oceanographer by the age of eight, and she went on to earn degrees in marine geology and geography. She now studies cracks (fissures) that form on the seafloor along spreading centers, and is a member of the faculty at Oregon State University. Knowledge of mathematics and computers, believe Wright and other women oceanographers, are critical to the way oceanography is now conducted. But the most important thing, Wright says, is a passion for learning about the oceans (or, in a fresh-water counterpart, learning about rivers, lakes, or ponds). That passion for study of the natural world, among other factors, has resulted in an increasing number of women in all science fields. According to statistics cited in the National Science Foundation report Science and Engineering Indicators 2002, women made up almost one-fourth of the science and engineering workforce in the United States in 1999. Short-term trends presented in the report reflect an increase in women employed in science (including water science) fields. The presence of women faculty members on college campuses may be an important factor in the recruitment of women to water science fields. A positive sign for female students looking to enter the aquatic sciences consists of National Science Foundation studies that have found that women hold a growing percentage of faculty positions and that this number likely will continue to increase over the next decade. Successful women in aquatic sciences stress the importance of a broadbased background. They encourage female students to learn to read, write, and think critically and to keep all possible career options open until reaching graduate school. These women suggest that it is not necessary to attend a college that offers an undergraduate major in marine science, although exposure to the field through a hands-on water science program is helpful. If a female student decides that a research career is no longer her first choice, there are countless other employment opportunities in the aquatic sciences for women and men alike. Aquatic ecology and fisheries biology are two of many water science fields that are attracting more women. This scientist is preparing to deploy a sampling device that will collect small organisms in an Indiana reservoir. 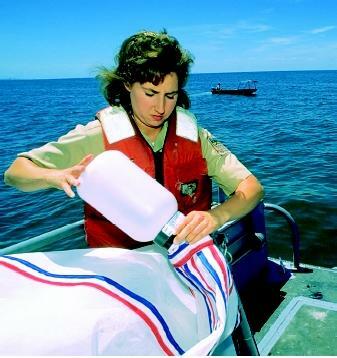 The sampling effort is part of a fisheries and water quality survey. as graduateand professional-level women in the aquatic sciences. Old stereotypes have largely changed, and there are more role models for young women seeking careers in these fields. 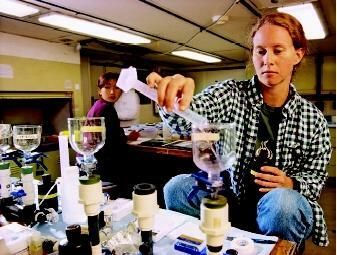 The road to a marine science career is long and demands perseverance, say women oceanographers and limnologists. But, they believe, this new century is one in which there are very few obstacles to prevent qualified women from achieving their potential in any field in the water sciences. SEE ALSO Earle, Sylvia ; Minorities in Water Sciences . Crane, Kathleen. "Sea Legs: Tales of a Woman Oceanographer." Boulder, CO: Westview Press, 2003. National Science Foundation. "Women, Minorities, and Persons with Disabilities in Science and Engineering: 2000." Available online at <http://www.nsf.gov/sbe/srs/nsf00327/start.htm> .